Wong studies the clinical and translational application of omics biomarkers for personalized medicine and personalized justice treatment approaches. Wong earned a master’s degree from the State University of New York and a doctorate from Virginia Polytechnic Institute and State University studying nuclear chemistry and radiopharmaceutical labeling. He completed postdoctoral training in nuclear medicine at the University of Connecticut School of Medicine. He was associate professor and director of the drug analysis division of the department of laboratory medicine at the University of Connecticut and associate professor of pathology and associate director of clinical chemistry at Johns Hopkins University School of Medicine. He also served as the toxicology scientific director at the Milwaukee County Medical Examiner’s Office and professor of pathology at the Medical College of Wisconsin. 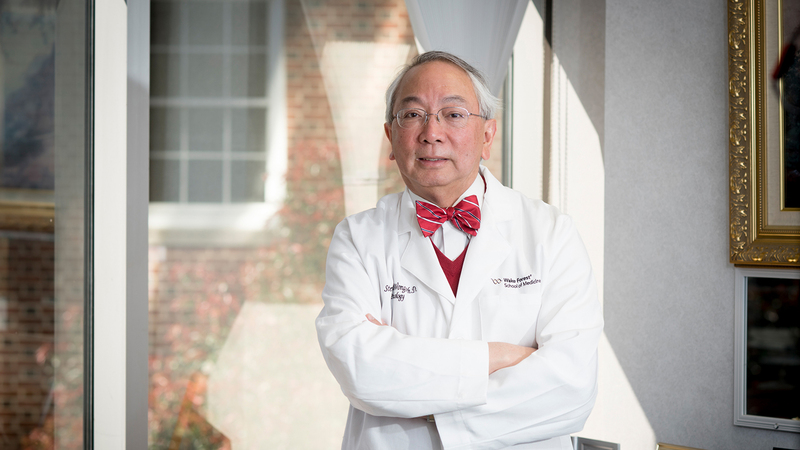 In 2011, Wong joined Wake Forest School of Medicine’s pathology faculty to further focus his research on personalized medicine and mass spectrometry. Wong’s research explores the clinical and translational application of metabolomics, proteomics and pharmacogenomics. Using mass spectrometry, he studies omics biomarkers for various diseases, including renal failure and breast cancer, examining renal metabolomics and the expression variation of the protein FLT3 in breast cancer. He also has expertise in therapeutic drug monitoring, with an emphasis on immunosuppressant and pain management therapy, and the role of metabolomics in treatment outcomes. With a unique interest in personalized justice and personalized medicine, Wong uses pharmacogenomics and pharmacometabolomics to explore the impact of genetic and environmental factors on toxicity post mortem. He develops molecular oral fluid proteome and metabolome specimen testing for clinical and forensic toxicology, with the goal of advancing personalized medicine approaches into these practices. Through widespread collaborations with industry, Wong further evaluates therapeutic development, drug toxicity, omics biomarkers and personalized medicine approaches. Wong is past president of the American Association for Clinical Chemistry, a member of the Drug Testing Advisory Board of Substance Abuse Mental Health Services Administration and a member of the National Cancer Institute’s Moonshot Applied Proteogenomics Organizational Learning and Outcomes Network (APOLLO)/Technology Working Group. Gain access to a variety of specialized research lab services and the expertise of in-house technicians through Wake Forest Innovations.